choosing an appropriate theatre space for this play, creating a ground plan and the design features to use/terminology on this ground plan, the actor/audience relationship for this play, using a composite set design, why adopting a minimalist set design might be beneficial for this play, the acoustics of the chosen performance space, creating sound cue sheets for extracts, using sound effects and the sound demands of this play, preparing costume plots and considering the main character representations through their costumes, colour symbolism and how it could be used with this play, Christopher's association with various colours, how to convey the changing depictions of Judy on stage, fabric and hairstyle choices for characters, depicting Christopher as a 'typical' teenager through his costume, the intensity, colour, form and movement of lighting choices, how to approach lighting choices when looking at an extract, type of lights available and their benefits, the positioning of lights, lighting angles, using the McCandless lighting system, using different lighting areas on a stage for various locations. This book has been designed as a collection of resources to use to help support your teaching of The Curious Incident of the Dog in the Night-Time for Eduqas' Component Three. It is perfect for you to use as you start to teach the play and are trying to encourage your students to look at the play from a design perspective. Each section is comprised of photocopiable double-spread pages for you to use with your students at whatever point in the play you are up to, whether it be teaching the entire play or looking at a specific exam extract. 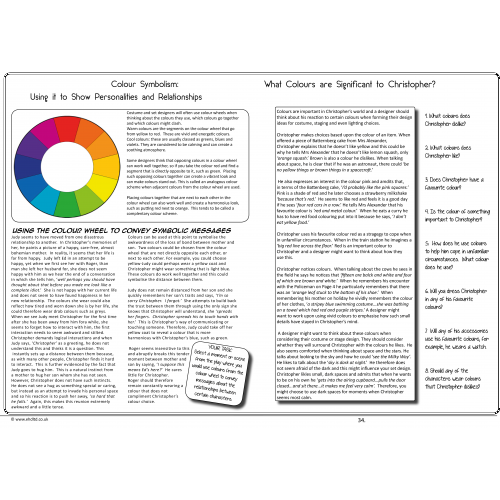 The full colour double-page spreads can provide you with a basis for your lesson, or they may be used as supplemental resources for you to use in class, for extra reading or homeworks. The spreads often provide short activities for students to complete which will allow you to assess understanding and aid revision for the exam. 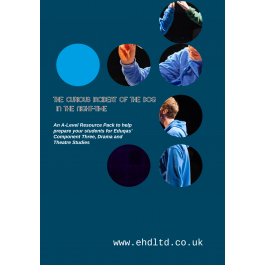 The resources will also encourage students to consider live theatre that they have seen and transfer their knowledge of this into their own interpretations of design features for Curious Incident. Please note, this book has been produced before the exam board released the set extract for this exam. Therefore, the book has not been written around one set extract. It has been designed as resources which can help you as you teach the play to encourage students to adopt a fully rounded design concept for the entire play. You will be able to use this book year after year and apply the theory to the set extract for that year.